This can be achieved using the Calendar Overlay option . · Let us consider we have three calendars – Calendar 1, Calendar 2, Calendar 3 and we want to fuse events of all the three onto Calendar 1 and also with unique color for events from each calendar . 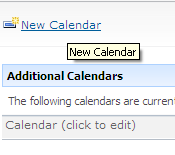 · We click on ‘New Calendar’ option in Calendar Overlay Settings page. Calendar Name, Type should be ‘Sharepoint’, Color can be chosen from the dropdown, Web URL refers to the site in which the calendar is. Once done, click on Resolve. This will populate all the calendars and their corresponding views for the last two options. After resolving, select the appropriate calendar and its view to be shown [from the respective dropdowns] – check in the ‘Always show’ option then finally click on Ok. Finally, if we come to Calendar 1, we would be able to see the events from three calendars collated into a single one.